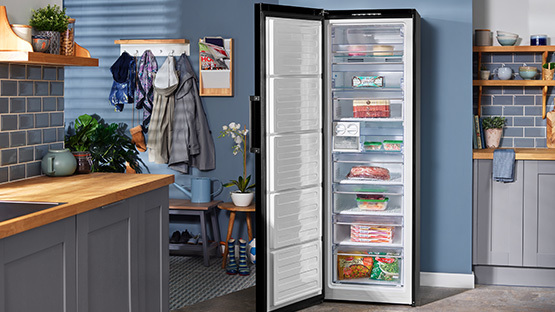 Whether you need a lot of storage space for all of your grocery favourites or are after the latest fridge and freezer technologies, our refrigeration buying guide will help lead you to the best appliance in our range to match your everyday needs. The first thing to decide on when buying a new refrigeration appliance, is the type and size that would most suit your everyday needs. Fridge freezers are the most common type of refrigeration appliance and are great for new families or for those who live on their own. 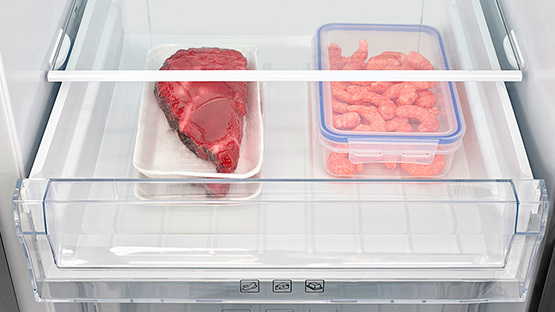 The freezer compartment is commonly found in the bottom half of the fridge freezer, however, our range offers models where the freezer can be found at the top too. Our range of fridge freezers comes in two types: two-door, and three-door models. The two-door models come in split types of 70:30 - the fridge holds 70% of the capacity and the freezer holds 30% of it, of 50:50 - both the fridge and the freezer hold 50% of the total capacity, of 60:40 and 40:60 where the fridge holds 60% or 40% and the freezer holds 40% or 60%, respectively, of the capacity. The three-door models offer an extra compartment featuring our MultiZone® technology. 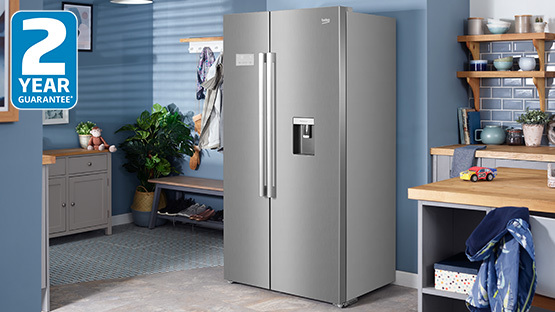 Coming in a variety of sizes to suit the space available to you, our fridge freezer widths range from 55cm, 60cm, 70cm to 92.5cm and their heights range from 136cm to 201cm. Having a dedicated refrigeration appliance for your frozen food is ideal for those who buy more groceries they’d like to freeze or for those who prefer to cook in bulk, freezing their food to use later on. 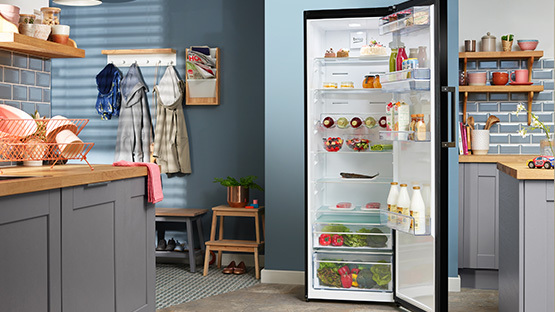 The Beko freezer range comes in three types, offering tall, under-counter and chest models. Tall freezers offer easy to access storage drawers and shelves to keep all the food you’d like to freeze. You can easily use a tall freezer alongside a tall fridge, for all of your cooling and freezing needs. Our tall freezer widths range from 54cm to 60cm and heights range from 145cm to 185cm. Under-counter freezers are perfect for those who have less food that they need to freeze or for those who live on their own and don’t need a freezer with a large capacity. Our under-counter freezer widths range from 47.5cm to 60cm and heights range from 81.8cm to 84cm. Chest freezers are great for those who are in need of extra storage for their frozen foods and are perfect to be used as a second refrigeration appliance in partnership with the main fridge freezer. Our chest freezer widths range from 54cm to 128.5cm and heights range from 86cm to 90.5cm. Great for larger families or for those who are after a larger storage capacity, our range of American style fridge freezers would be best. Our range of American style fridge freezers comes in two types: two-door side by side, and multi-door models. 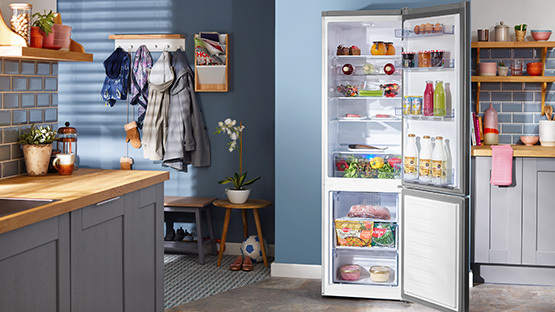 The two-door side by side models offer the sought after American style look and feel while the multi-door models offer a stylish design with flexible storage options – perfect for those who like to use each of their fridge freezer’s shelves for specific food types. When looking for an American style fridge freezer, bear in mind that our range’s widths vary from 74cm, 84cm to 92.5cm and heights vary from 177cm to 185cm. Placing a refrigeration appliance in your home solely for your cooling needs is great for families who buy lots of fresh food and can benefit from the extra capacity. The Beko fridge range comes in two types, offering tall and under-counter models. Tall fridges come with many adjustable shelves as well as one or two crisper drawers to store your fresh fruit and vegetables. Tall fridges are great to use in partnership with a tall freezer to offer a huge combined cooling and freezing capacity. 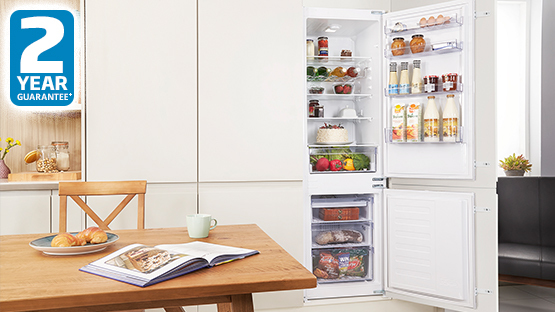 Our tall fridge widths range from 54cm to 60cm and heights range from 122cm to 185cm. Under-counter fridges offer a smaller capacity which is ideal for those living on their own or for those who don’t have a big need for storing fresh food. Our under-counter fridge widths range from 47.5cm to 60cm and heights range from 81.8cm to 86.6cm. Our range of refrigeration appliances also offers integrated fridge freezer, integrated fridge and integrated freezer models which are neatly concealed behind a cupboard door to match the rest of your kitchen. To find out more about our built-in and integrated appliances, click here. Before committing to buying a new refrigeration appliance, it’s important to familiarise yourself with the three different cooling systems our range uses to function on. If you’re buying on a budget, go for a manual defrost freezer or fridge freezer. We recommend you keep your freezer clear of ice build-up while saving valuable storage space by manually defrosting it twice a year. 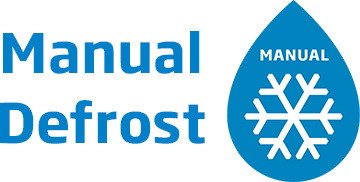 Our freezers with Frost Free technology automatically defrost themselves so you don’t have to. No chance is left for ice to build up thanks to an automatic fan which removes warm air that enters your freezer when the door opens. Fridge freezers with this technology come with two separate cooling systems, powered by automatic fans, allowing for 2x faster cooling, fresher food and a freezer you won’t need to manually defrost. 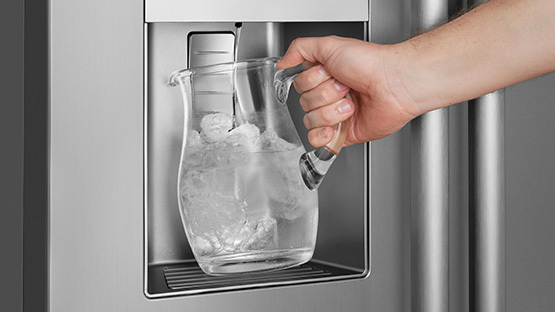 Purchasing a refrigeration appliance with an integrated water & ice dispenser offers convenience and helps you benefit from cool and refreshing ice and water on tap. The Beko refrigeration range offers plumbed and non-plumbed options including water-only dispensers as well as water and ice dispensers. For non-plumbed options, Beko fridges and fridge freezers come with a cleverly designed slim, easy-to-fill water tank which fits neatly on the fridge door without taking away from the space you need to store your groceries. When opting for a plumbed dispenser, you need to first make sure that you’re able to place your new refrigeration appliance as close to a water supply as possible. We recommend within 1.5m of a water supply, so that you can fully benefit from the convenience of the water and ice dispenser. When buying a refrigeration appliance, be sure to make yourself aware of the ways your fridge or freezer can keep your food fresher for longer. The Beko refrigeration range offers technologies and features which maintain the freshness of all the food you love. Air and humidity in the crisper drawer are managed via special air channels to keep your fruit and vegetables fresh for up to 30 days, helping you to reduce the amount of food you throw away. Using blue LED lights, the fruit and vegetables you store in the crisper drawer are encouraged to continue photosynthesising, so their Vitamin C content is maintained, helping your food stay fresher for longer. A dedicated drawer which keeps the temperature around 0°C, offering a perfectly suited environment for you to store your meat, fish and dairy foods in so that they can maintain their freshness. 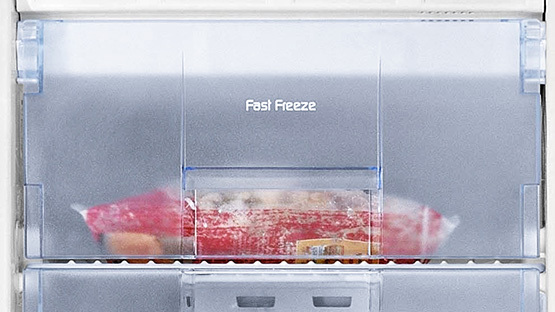 Ideal for locking in your food’s vitamins and nutrients, the top compartments in some of our freezers can freeze your food 10% faster than the other shelves can – perfect for when you want to freeze fresh food straight after you buy it. It’s always a great idea to consider the extra features your new refrigeration appliance will come with. Here are a couple of the extra features in the Beko range. Whether you need to place your new freezer or fridge freezer in your garage or outbuilding, Freezer Guard works to ensure your freezer will always function properly, even if the surrounding temperature drops to as low as -15°C. Offering flexible cooling or freezing, the MultiZone® compartment in our fridge freezers and American style fridge freezers can become either at the touch of a button, perfect for when you need more fridge space in the summer or more freezer space in the winter. Whether you already know you want an American style fridge freezer for your kitchen or are still in the decision making stages, here are our top things to consider before you buy. Be sure to measure the space you have available so that you’re buying a refrigeration appliance that suits your kitchen. Measuring in centimetres, make a note of, most importantly, the width and height, although the depth may be handy to make a note of too. Don’t forget to take the space needed to open the fridge or freezer doors into account. Refrigeration appliances are one of the largest of kitchen appliances, so be sure to measure the size of the entrances into your home - you don’t want to be in a position where you’ve purchased a new fridge freezer only to find out that you can’t actually get it into your home easily. Fridge freezers work hard to keep your food fresh as well as frozen, and so, need plenty of ventilation room. 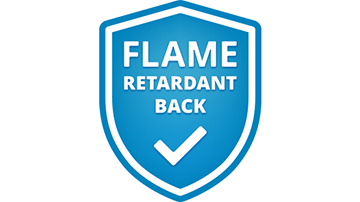 Make sure to account for at least 25mm of empty space around the sides, 30mm at the back and 50 mm on the top of the appliance. Or, if you’re looking for an integrated refrigeration model, head over to our built-in buying guide to find out what you should be considering before you buy. Decide on whether you’d like to place your new refrigeration appliance in your home or in an outbuilding. If you’re looking to purchase a fridge freezer that works in a garage, look out for our Freezer Guard technology.